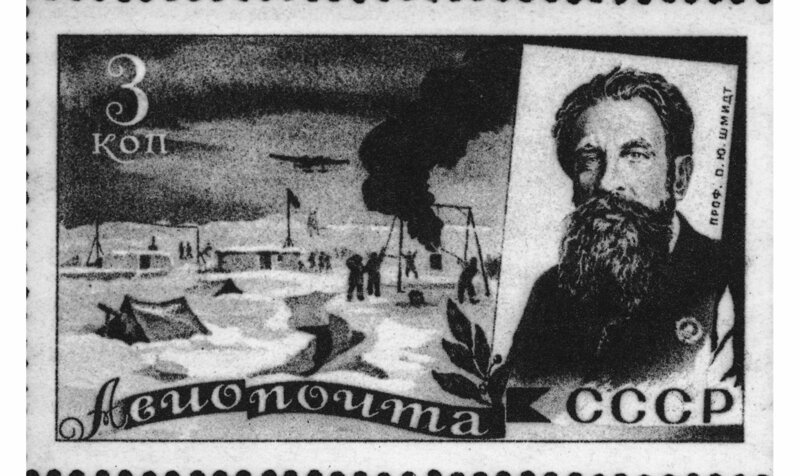 Since the 1930s, philatelists have collected stamps commemorating Arctic research, many of which are very rare. 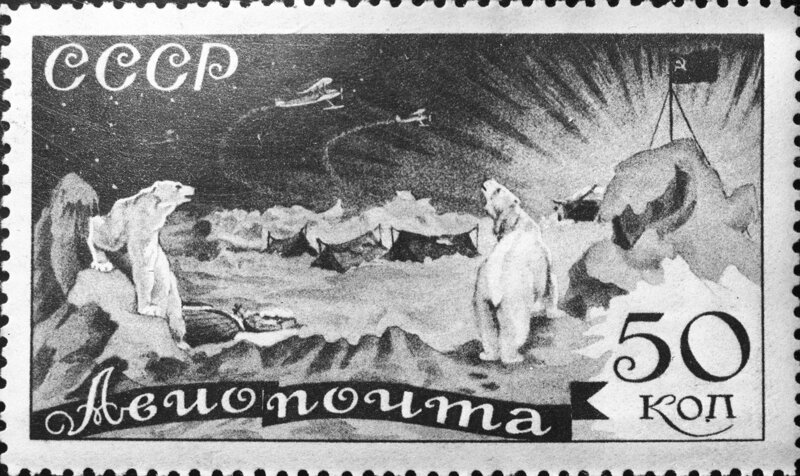 Arctic.ru presents an article on the history of Arctic stamp collecting prepared by the Future of the Arctic project. "Without a doubt, radio is a great invention, but post is a miracle," the famous pilot and Arctic researcher Richard Byrd once said. He was referring primarily to polar research in the Antarctic because his main achievements were connected with this continent. However, this American pilot's interesting sentiment also concerns the Arctic. The Arctic has prompted one of the most interesting areas for collection, polar stamps, which has continued for many years. 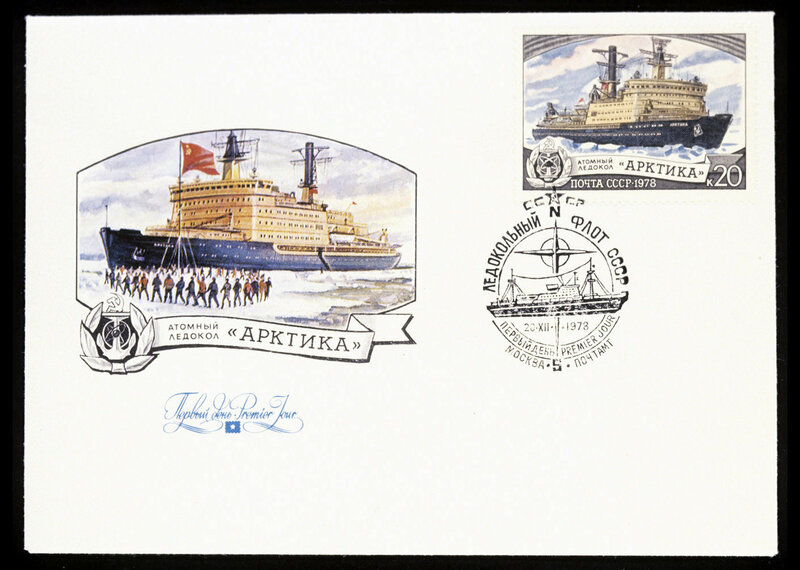 In the USSR, the history of polar philately begins in 1931, when a series of stamps dedicated to the Malygin ice breaker and its meeting with the LZ 127 Graf Zeppelin in Tikhaya Bay was issued. The Malygin had proved itself in several expeditions in the Arctic Ocean, including the search for Nobile's airship Italia, and the Graf Zeppelin was known for its daring long-distance flights and the first full flight around the world. 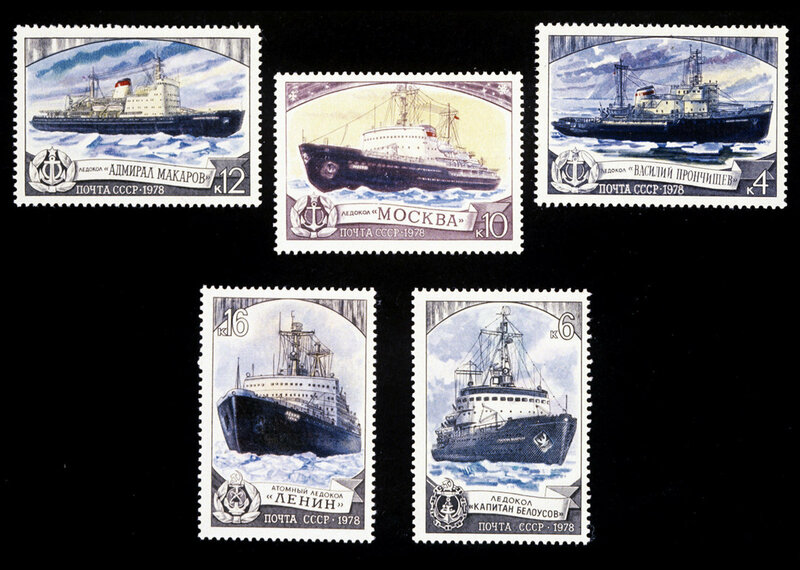 Special stamps were issued to commemorate this meeting, and the Soviet and German governments had agreed the vessels will exchange mail in Tikhaya Bay. 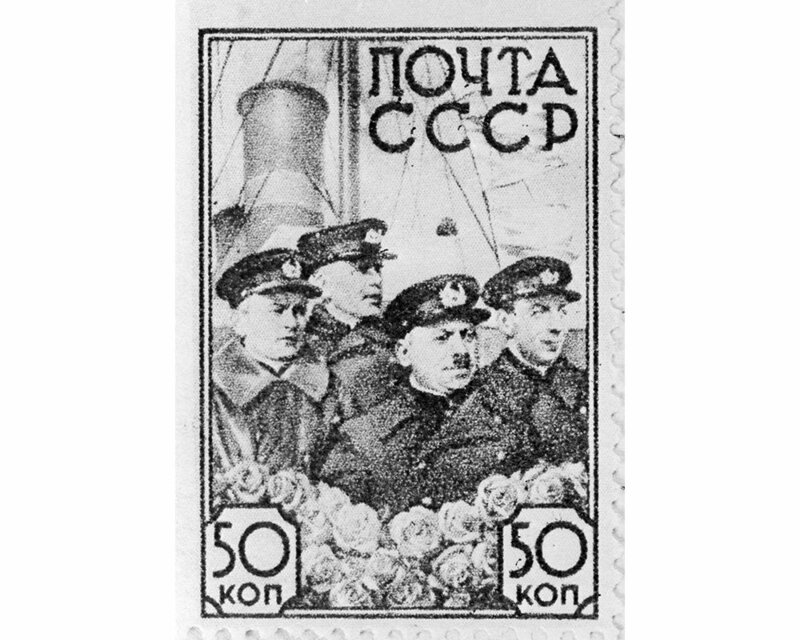 The USSR was represented by Ivan Papanin aboard the ice breaker, and Soviet radio operator Ernst Krenkel on the zeppelin. 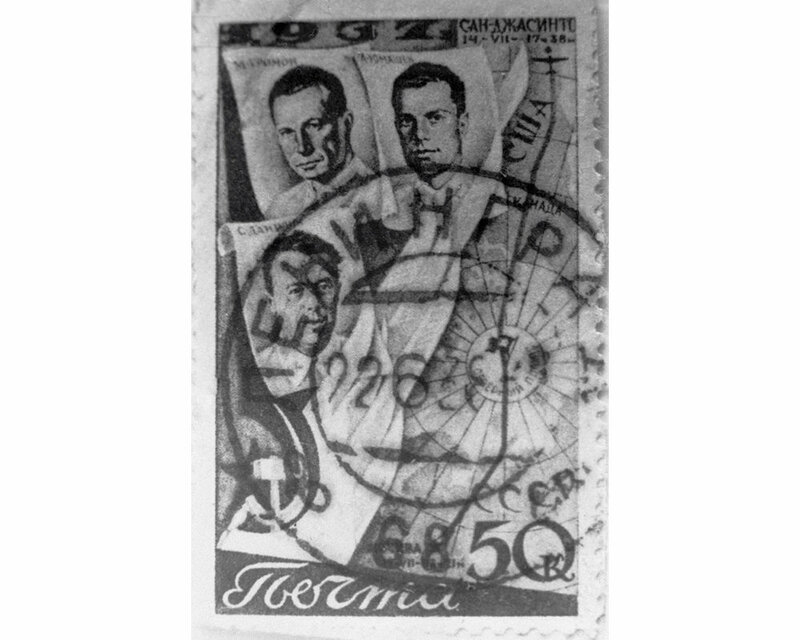 Both stamps were designed by Vasily Zavyalov, who would later become a leading post graphics master. 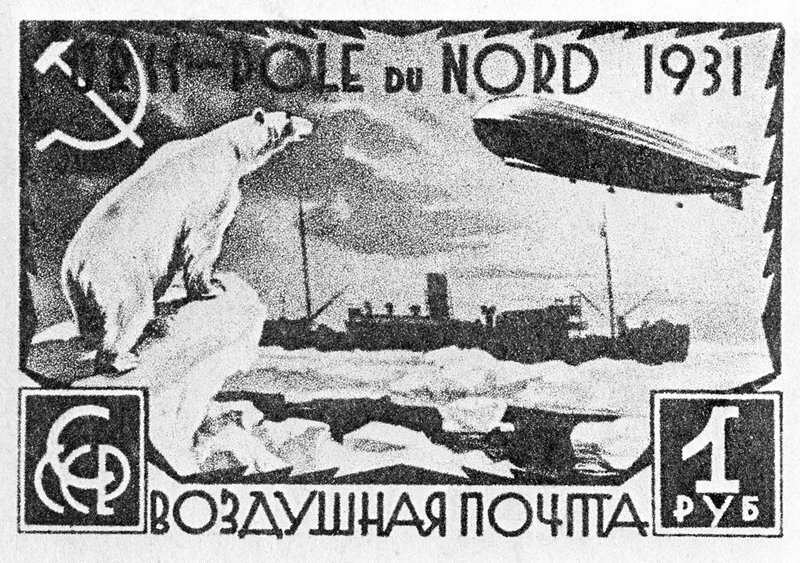 During the second International Polar Year in 1932—1933, the USSR became the leader in Arctic research. 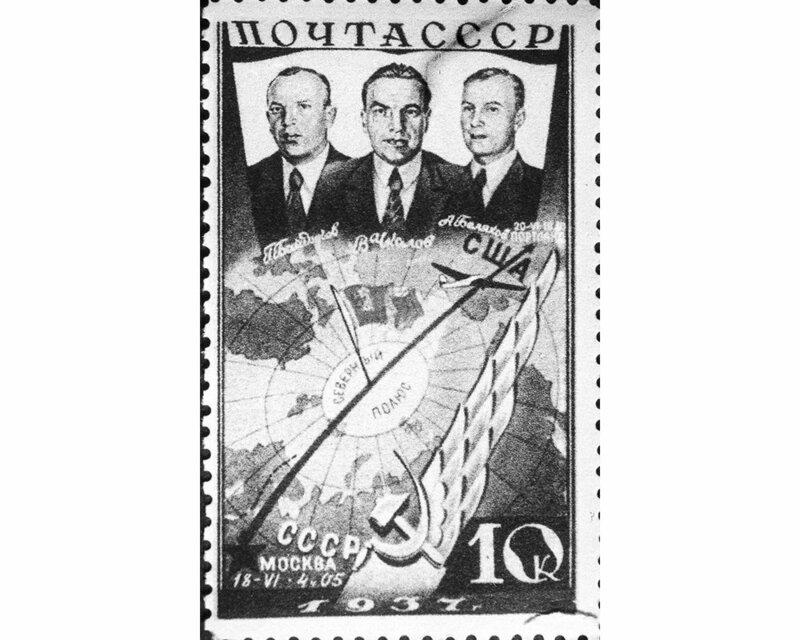 By that time, several advanced geophysical observatories and hydrometeorological stations had been established; and the Soviet Union was very interested in promoting Arctic exploration. 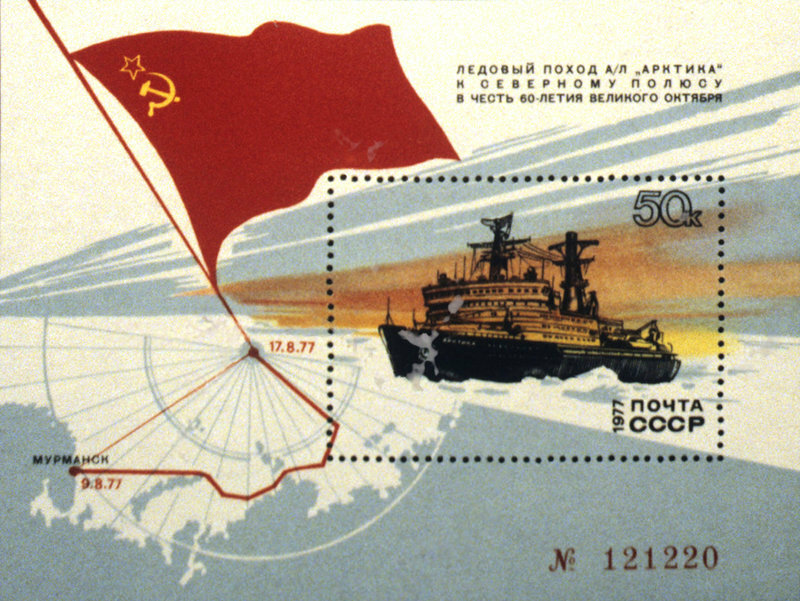 A series of stamps dedicated to the flight from Franz Josef Land to Arkhangelsk to commemorate this event were issued. 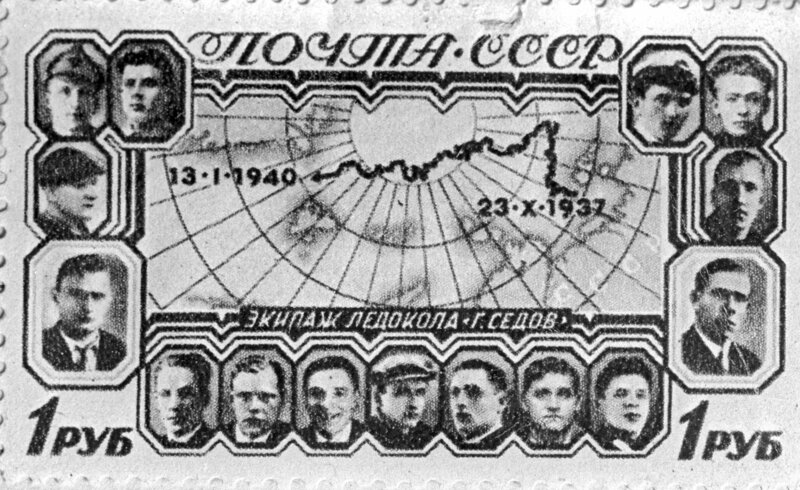 The stamps were cancelled with a special round wooden stamp with "Franz Josef Land" engraved on it, and the envelopes had the date, 26.8.32, with the words "Second International Polar Year 1932/33: First polar flight 1932"
However, the flight did not take place due to technical problems, and the envelopes and the stamps had already been issued. 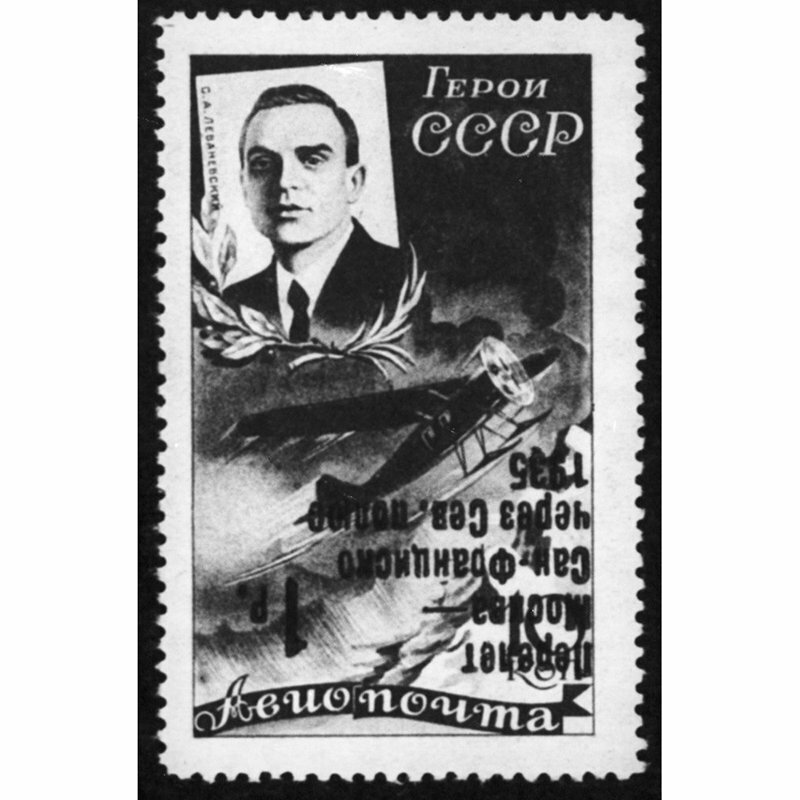 Now they are very rare and are considered a philatelist curiosity: there are stamps (envelopes) but no flight. 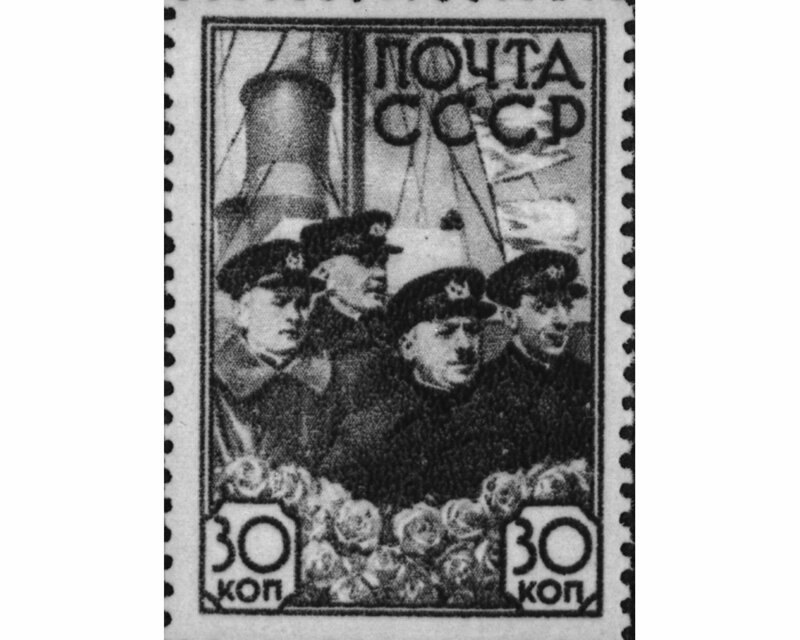 SS Chelyuskin crew's story plays a special role in the history of Polar stamp collecting. 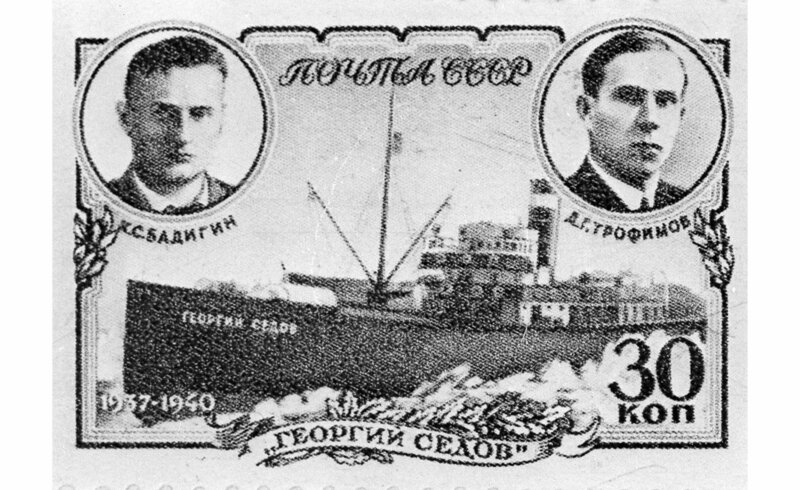 In August 1933, the Chelyuskin ice breaker left Murmansk to continue exploring sea routes and promote navigation: in 1932, the Alexander Sibiryakov ice breaker sailed from Arkhangelsk to the Bering Strait and hence navigated the entire Northern Sea Route. Head of the expedition Otto Shmidt decided to navigate the same route aboard a heavy dry-cargo ship to coordinate sailing between freighters and ice breakers. The Chelyuskin was caught in ice fields in the Chukchi Sea and sank on February 13, 1934. The crew and the passengers (104 in total), except one man who perished, abandoned the ship and built the Shmidt Camp, or the Chelyuskinite Camp, on ice, where they lived, worked and even carried out research for two months. An air rescue mission started at the beginning of March, but it only managed to evacuate the camp on April 13, 1934. 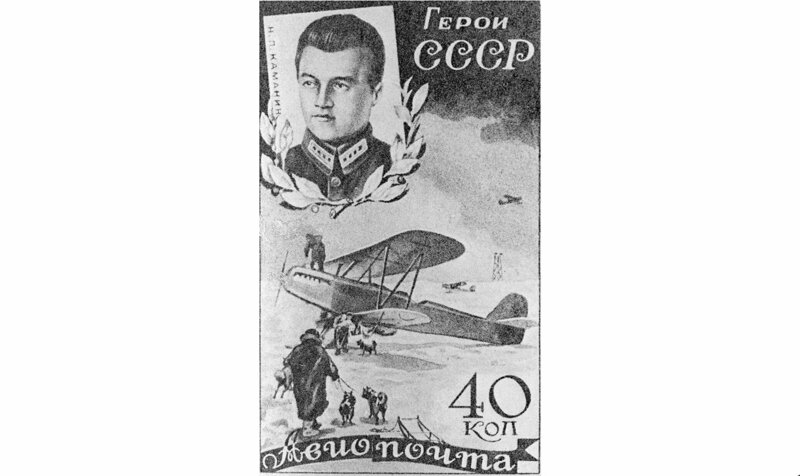 Seven pilots, including Sigizmund Levanevsky, who also needed help, became the first Heroes of the Soviet Union. 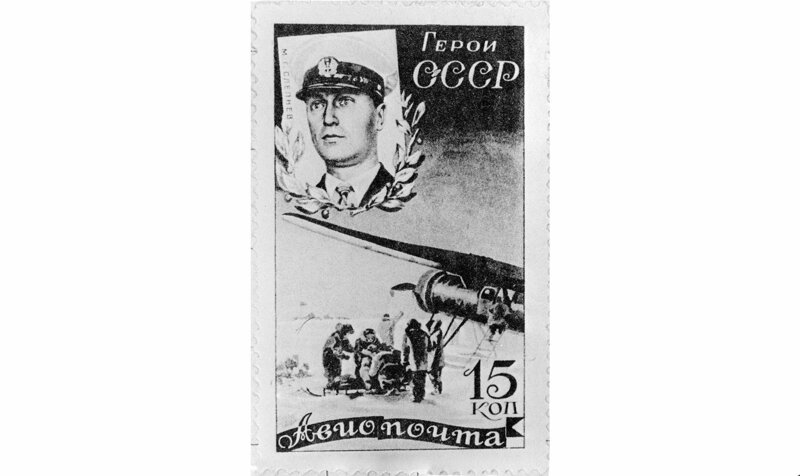 All of Moscow came to meet the Chelyuskinites, and the Soviet post issued a series of stamps portraying pilots, Otto Shmidt and Captain Voronin. 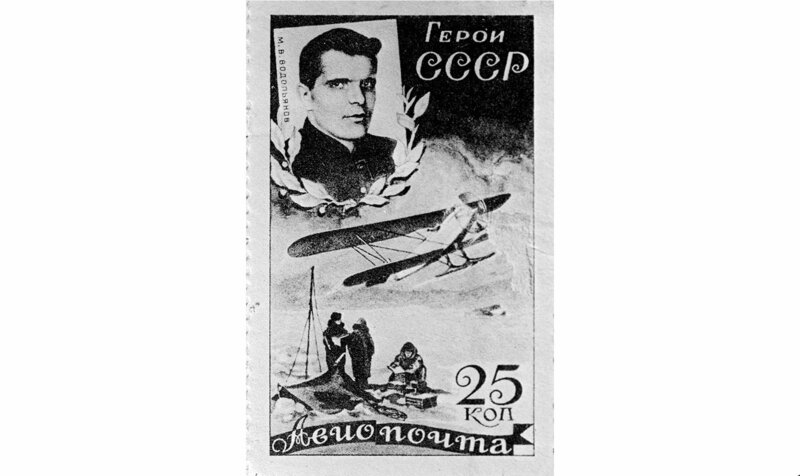 In 1935, Sigizmund Levanevsky was planning a flight from Moscow to San Francisco. 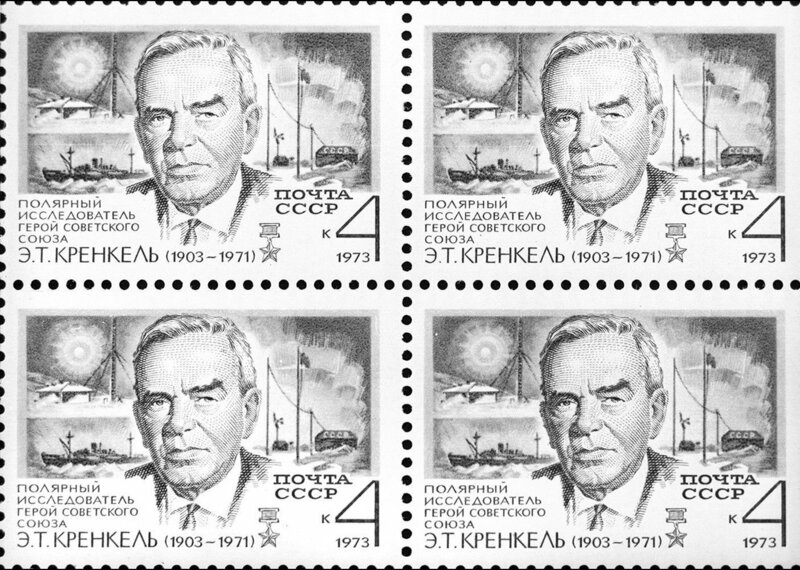 A special run of stamps with his portrait was created. 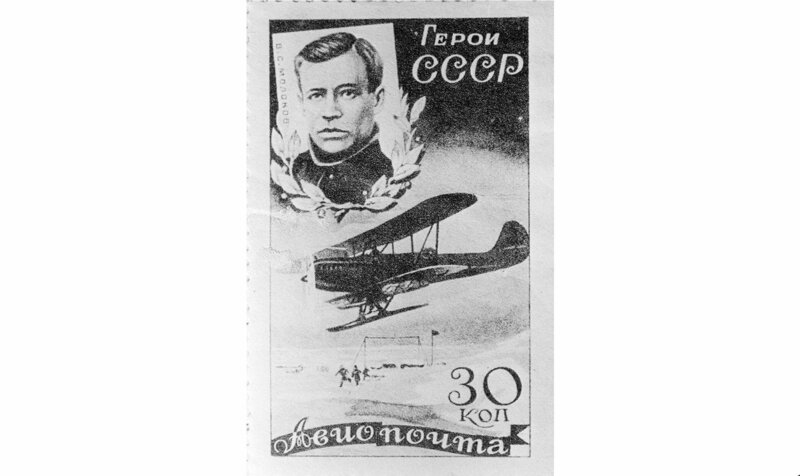 The 2,000-kilometer flight was interrupted because of an oil leak, but the issued commemorative stamps had already existed. When the printing blocks were made, the workers made two mistakes: the letter F in San Francisco was lowercase, and the inscription was printed upside down on several stamps. 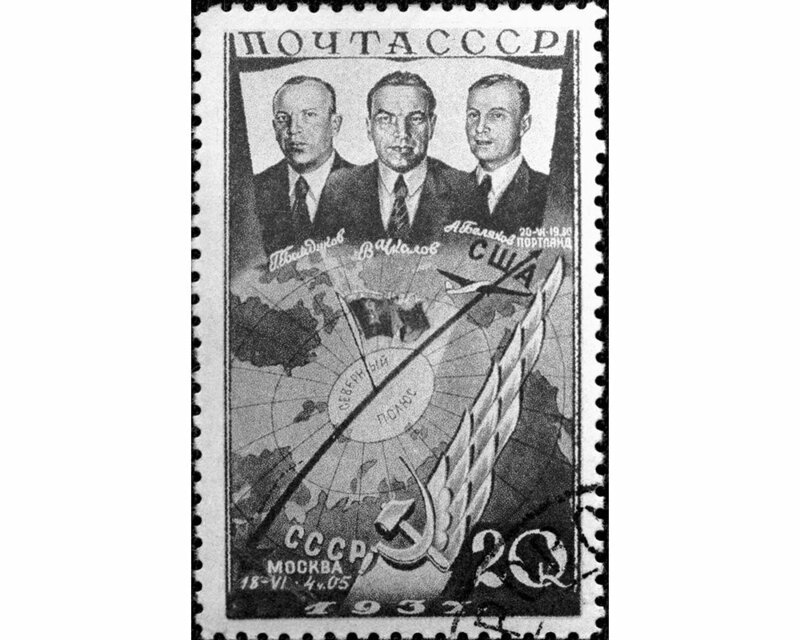 1937 was a special, epoch-making year in the history of polar exploration, which saw the launch of the first North Pole drifting station and the first transpolar flights performed by air crews under Valery Chkalov and Mikhail Gromov. 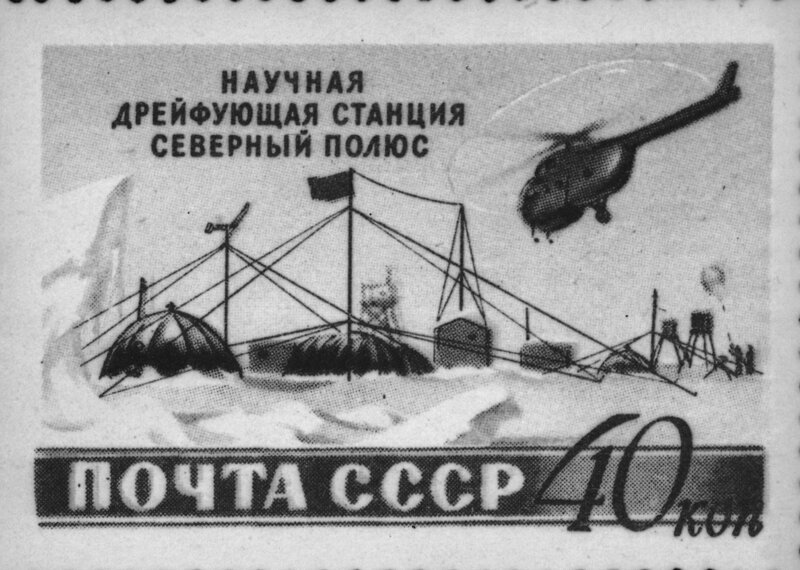 The drifting station was honored by two series of postage stamps and the polar flights by one. 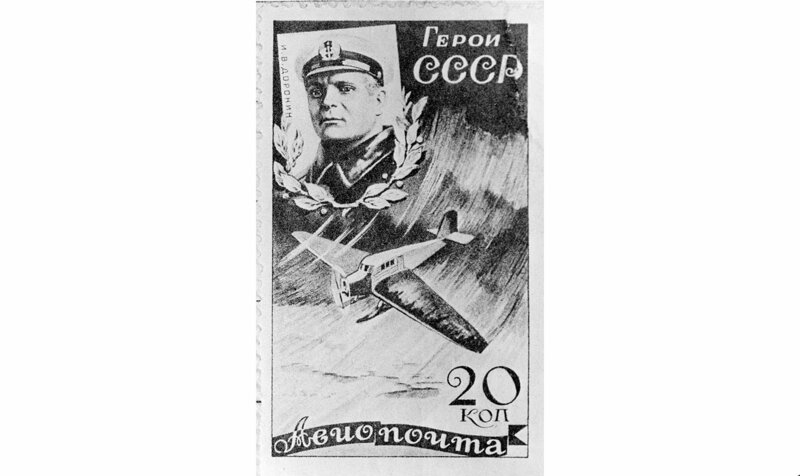 The first series is dedicated to the air expedition that landed personnel and equipment for North Pole-1 on an ice floe, and the second one, with portraits of the polar explorers, was issued already after the drift ended, in 1938. The three-year drift of the Georgy Sedov icebreaker, which began in 1938, when it was trapped in ice, came to an end in 1940. The ship spent 812 days in the Arctic Ocean as a drifting research station, collecting data on the Arctic's hydrometeorological conditions. 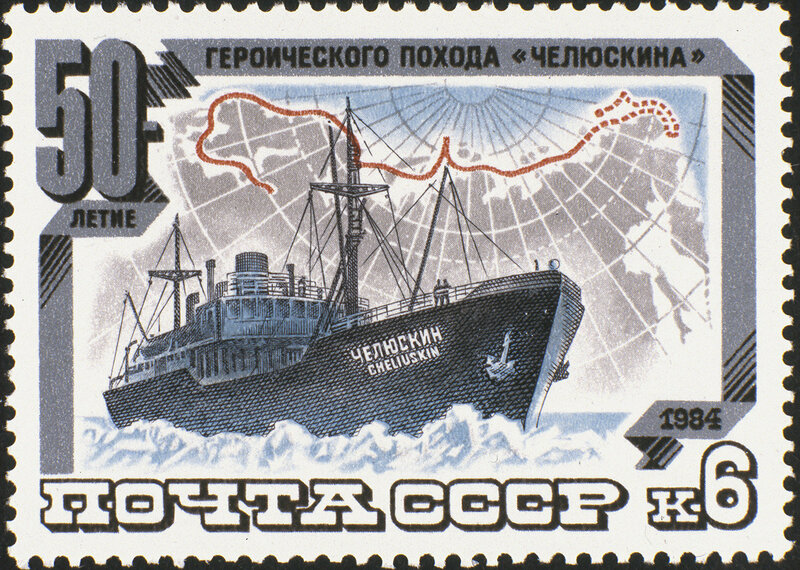 The drift ended in the area of Spitsbergen (Svalbard), where the ship was rescued by another Soviet icebreaker, the Joseph Stalin. 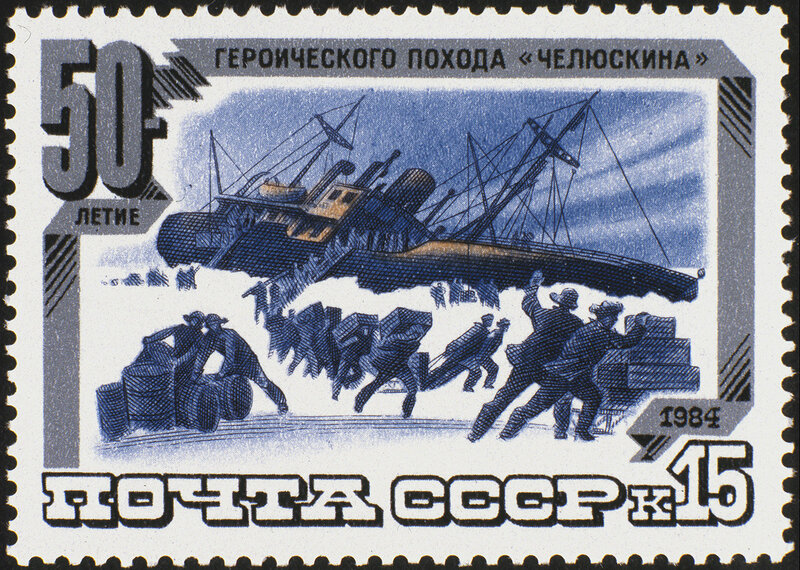 This heroic epic was commemorated by a postage stamp series with the portraits of all expedition members. 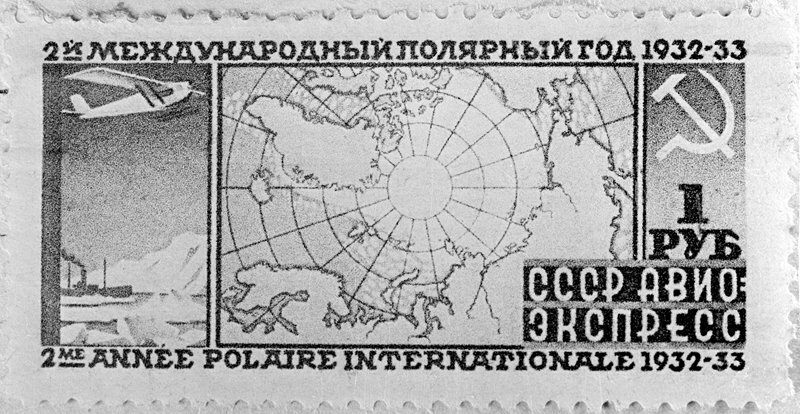 The USSR resumed polar explorations only after the war in the early 1950s, when the government decided to relaunch North Pole expeditions. North Pole-2 had a military mission, which was not covered by the press, and the expedition members were under a pledge of secrecy for a long time. But North Pole-3 was more open. One of the most popular polar explorers at that time was Vitaly Volovich, who composed his famous "Polar Waltz" while adrift on the floe. 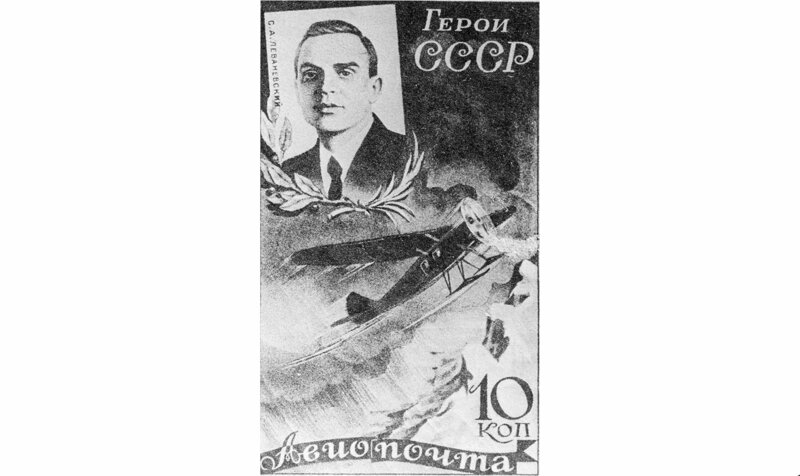 The song was often broadcast on the radio, and Volovich received a huge number of letters from listeners, who thanked him for the song, inquired about the station, or asked for the gift of a polar bear cub. 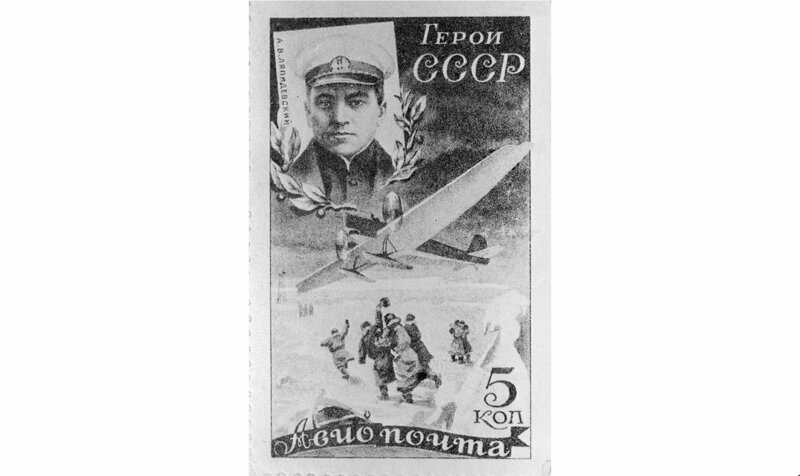 The drifting ice station had no address, and so the letters were sent to: "The Arctic, North Pole-3 Drifting Ice Station, Dr Vitaly Volovich", or just "Extreme North, North Pole-3, Doctor Vitaly Volovich" and the letters reached their destination. North Pole-4 was the first to launch a so-called post office. In reality, this was an expedition member with a postmark stamp, who volunteered to take care of the mail in addition to his official duties. All subsequent drifting stations carried on this practice. 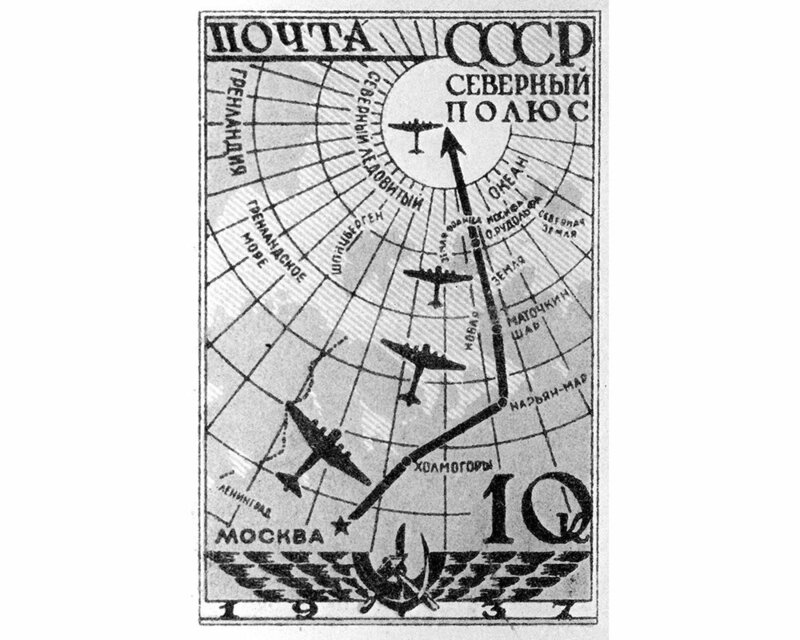 An interesting story took place at the North Pole 19 (SP-19) Soviet Komsomol youth station. 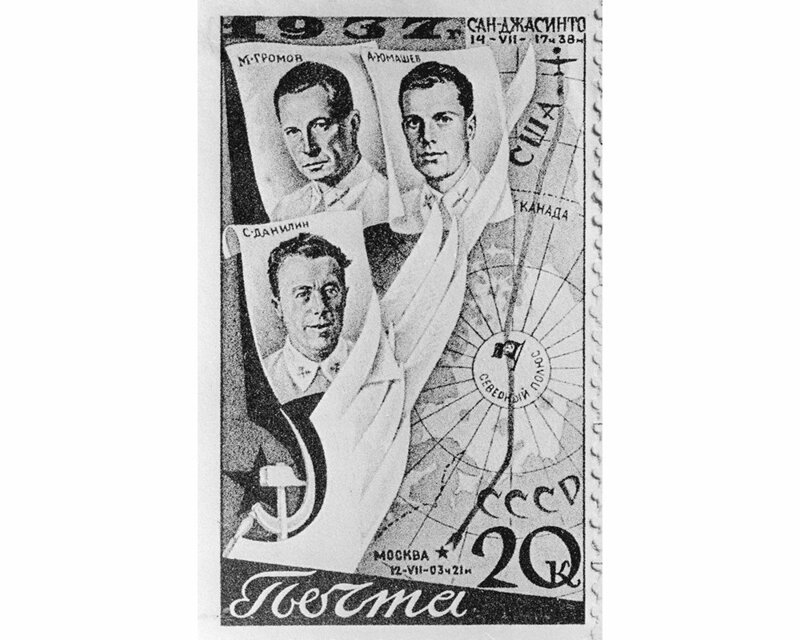 Back then, the Arctic and Antarctic Research Institute in Leningrad issued 2,000—5,000 so-called "service" envelopes for each station. They were used for the official correspondence for those on the stations. 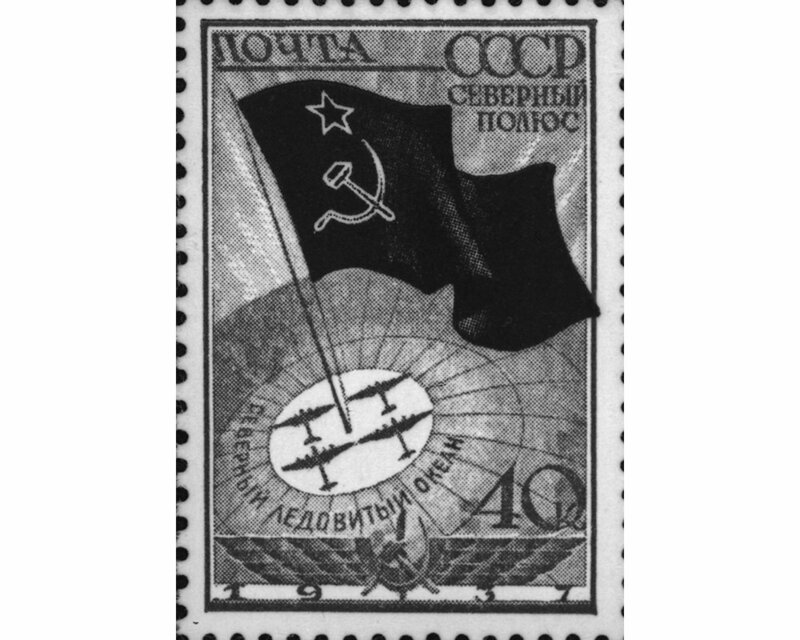 There were 3,000 SP-19 (NP-19) envelopes with the Komsomol insignia issued for the station, but the stamps on them were only cancelled once: on November 7, 1969. The envelopes with the cancelled stamps were sent to the mainland on a plane (that came to the station in December), and the rest were left with the wooden stamp at the station. On the eve of 1970 the station was compromised: a big crack crossed the middle of the ice "town". The ice block where the tent with post equipment was turned upside down and everything, including the envelopes, was lost. The next shift got new envelopes, but without the Komsomol insignia. Three years later, the Arctic and Antarctic Research Institute received a letter from Greenland that read that local residents had found a container with the words "SP-19" written on it, which had all the station's equipment, including clean envelopes with the Komsomol insignia. In 1977, it was decided that the Arktika nuclear ice breaker would reach the North Pole: it would be the first surface vessel to do so. The organizers were not sure of the operation's success, so the expedition was kept secret. A postal certificate was created aboard the ship at the North Pole's point on August 17, 1977. However, the souvenir wooden stamp itself used to cancel stamps on letters was accidently lost in the Arctic Ocean. After this voyage, the organizers took the postal equipment on expeditions more seriously. Now when a large expedition reaches the pole, the head of philatelist program cancels stamps and envelopes in a cabin aboard the ship or in a hut on the drifting ice. So, when it was decided to resume the use of North Pole drifting stations in 2003 and first polar researchers settled on drifting ice in April, they received everything they needed to work on ice for a year: construction materials, equipment, food and, of course, two kinds of envelopes and several souvenir stamps for cancelling. 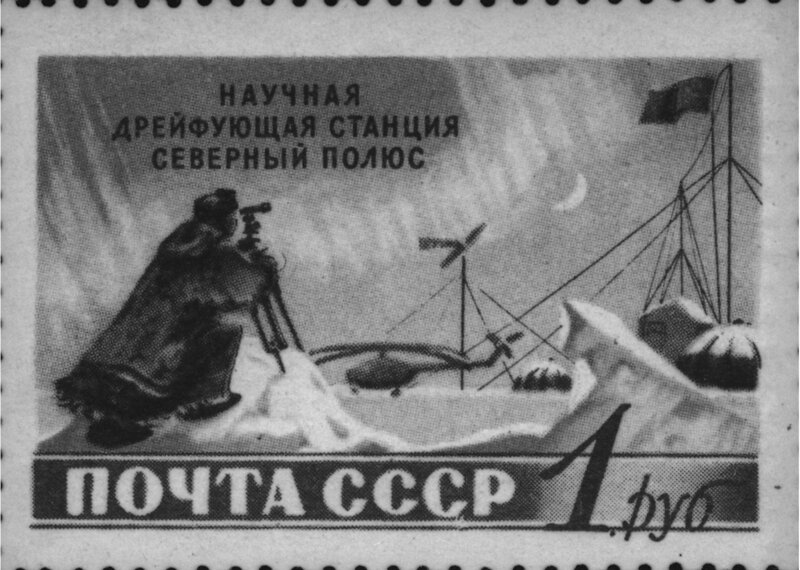 Since then, every station has had a drifting "post office"
Since 2000, Russia has issued postage stamps dedicated to polar research almost every year. The first series after a long pause was the issue commemorating the polar researchers who worked at the Arctic and Antarctic Research Institute and its 80th anniversary. Later, many envelopes and postcards with portraits of polar researchers as well as commemorative stamps picturing anniversaries and important events in the Arctic were issued. Richard Byrd was right when he said post was a miracle. These yellowed envelopes with stamps have been preserved and transferred from generation to generation, and are real evidence of humanity's struggle and heroism in the Arctic. They not only hold the memories but also the living feelings of people who made history and who witnessed it.